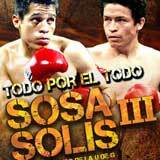 Review: 2013-03-09, the third fight between Edgar Sosa and Ulises Solis gets three stars only for the good finish. Edgar Sosa (47-7-0) entered as the No.11 flyweight in the world while Ulises Solis (35-2-3) entered as the No.13. In their two previous fight Solis defeated Sosa by a close decision (in 2001 and 2003); Sosa vs Solis 3 is valid for the WBC Silver flyweight title. Watch the video!